Dive to the depths of the ocean to discover an underwater world occupied by Mermaids and Mermen. Click here to play! Help them to keep their magical city a secret from the prying minds of the land dwellers who want to expose and exploit their generous nature. If you succeed in this adventure, you'll be awarded treasures beyond belief. Stick close to the Merpeople as they fight to keep their civilization a secret under the sea. 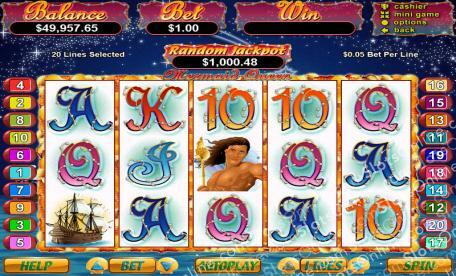 Mermaids act as substitutes and will replace almost all other symbols to help you create more winning combinations. They only appear on reels 1, 3 and 5, but if you can spin three on these reels, you'll unlock a secret bonus feature. Mermen are also helpful, as five of them on a pay line will give you up to 7500 times your original line bet. Ships will be everywhere, trying to catch a glimpse of these underwater people. If you collect two to five ships, you'll get up to 2500 times your bet. Fish and jewels will also pay out, so watch out for them as well. If you can manage to spin two to five Giant Clams anywhere on the board, your total bet will be multiplied respectively. They'll also award free games if they appear in the bonus feature. Save the Merpeople from the land dwellers before it's too late! If you can manage to keep their secret, you'll be rewarded with innumerable treasures. The Giant Clam Shell is the scatter symbol. If you get two to five of these symbols, your total bet will be multiplied respectively. If you spin a Mermaid on 1, 3 and 5, you will trigger ten free games. For each Giant Clam that appears in your free games, you will get an additional free game. Prizes are doubled for the first ten games and tripled in each additional game. The Mermaid with firey red hair will substitute for all other symbols on the bord, excluding the scatters. They only appear on reels 1, 3 and 5.